SNAFU! 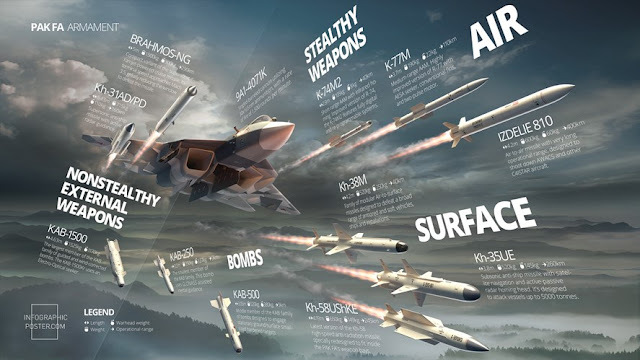 : PAK FA armament graphic...yeah...it DOES air to ground! PAK FA armament graphic...yeah...it DOES air to ground! I've been monitoring the comments on my blog post about the SU-57 going to Syria. More than a few people have stated that the SU-57 is suppose to be the analog of the F-22. Pure air to air. I don't think anyone has noticed but the Russians don't build "pure" fighters. They build a rock solid fighter platform and then do what we used to. Employ it to go air to ground. That was the secret sauce of the F-15 and F-16. They were not a pound for air to ground but because they were awesome fighters they were great attack platforms too. That wasn't the first time in history either. The P-51, F4U Corsair and A-4 SkyHawk all flexed between roles with aplomb. WTF am I getting at? The PAK FA SU-57 will be dropping bombs and firing rockets in Syria. They designed it to strike and I believe it'll get the job done.